Using the General Properties command of the 3D Properties window helps you to select several options. • Background Color: Change the background color to any desired color you like. • Background Image: Use a bitmap image for the background. • Wireframe: You can choose to show the animation as Wireframe. • Fogging: Fog in any desired color can be added to the animation. The fog is minimal at a start plane and maximal at an end plane. You can set the distance of these planes. • Render Type: Choose wireframe rendering or full rendering. • Grid: You can choose to show a grid. • Frames: Set the frame scaling and thickness. 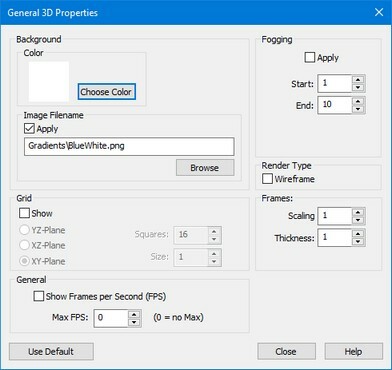 • General: Show the number of frames per second and maximize the number of frames per second.